This fun and vibrant print will make a fantastic and quirky gift for anyone who is addicted to stationery. Equally perfect to adorn your own wall if you yourself are the #StationeryAddict! The illustration shows a colourful collection of stationery items, including notebooks, pens, pencils, paperclips and pencil sharpeners. 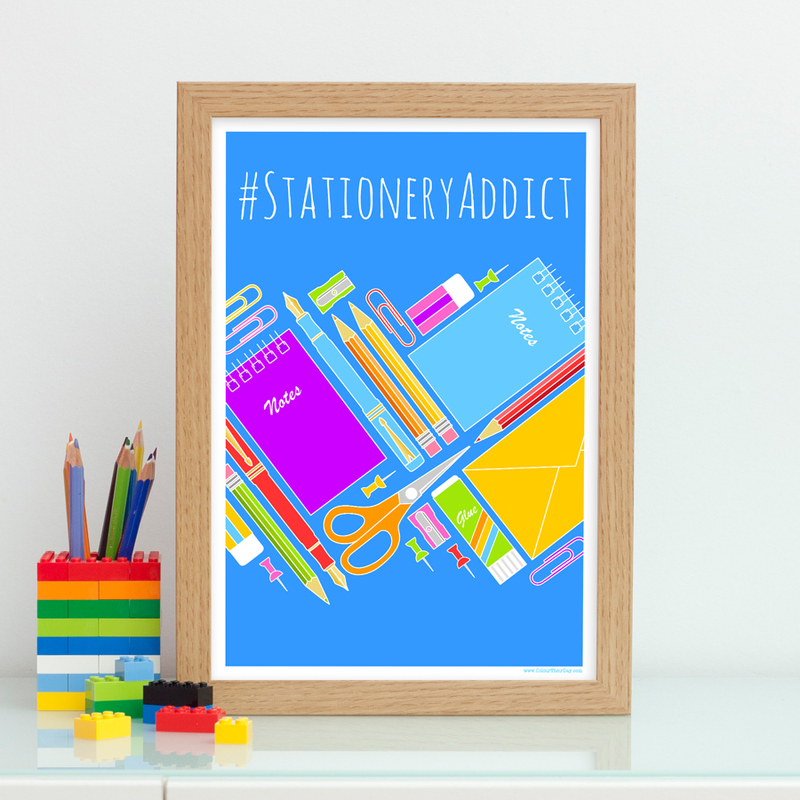 The phrase ‘#StationeryAddict’ is printed in white text on an electric blue background. The print is available in 5×7 inch unframed, A4 unframed, A4 framed and A3 unframed. This print is available in four variations; 5×7 inch unframed, A4 unframed, A4 framed and A3 unframed. The product image shows the A4 framed print. The 5×7 inch print and A4 unframed print will be supplied in a cello bag with a rigid piece of cardboard. The A3 print will be protected with tissue paper, carefully rolled up and placed in a tube. The prints will fit in any widely available A4 or A3 frame. Be the first to review “Stationery Addict Print” Click here to cancel reply.